NTLDR (NT Loader) is a small piece of software that's loaded from the volume boot code, part of the volume boot record on the system partition, which helps your Windows XP operating system start. NTLDR functions as both a boot manager and a system loader. In operating systems released after Windows XP, BOOTMGR and winload.exe together replace NTLDR. If you have multiple operating systems installed and properly configured, NTLDR will show a boot menu when your computer starts, allowing you to choose which operating system should load. A common startup error in Windows XP is the NTLDR is Missing error, which is sometimes seen when the computer tries to inadvertently boot to a non-bootable disc or floppy disk. However, sometimes the NTLDR error is caused when attempting to boot to a corrupt hard drive when you really meant to boot to a disc or USB device running Windows or some other software. In this case, changing the boot order to the CD/USB device would likely fix it. The purpose of NTLDR is so that a user can choose which operating system to boot into. Without it, there would be no way to direct the bootup process to load the operating system you want to use at the time. Accesses the file system on the bootable drive (either NTFS or FAT). The information stored in hiberfil.sys loads if Windows was previously in hibernation mode, which means the OS just resumes where it was last left off. If it wasn't put into hibernation, boot.ini is read from and then gives you the boot menu. NTLDR loads a specific file described in boot.ini if the operating system that's selected isn't an NT-based operating system. If the associated file isn't given in boot.ini, then bootsect.dos is used. If the operating system selected is NT-based, then NTLDR runs ntdetect.com. The menu options when selecting an operating system during boot up, is defined in the boot.ini file. 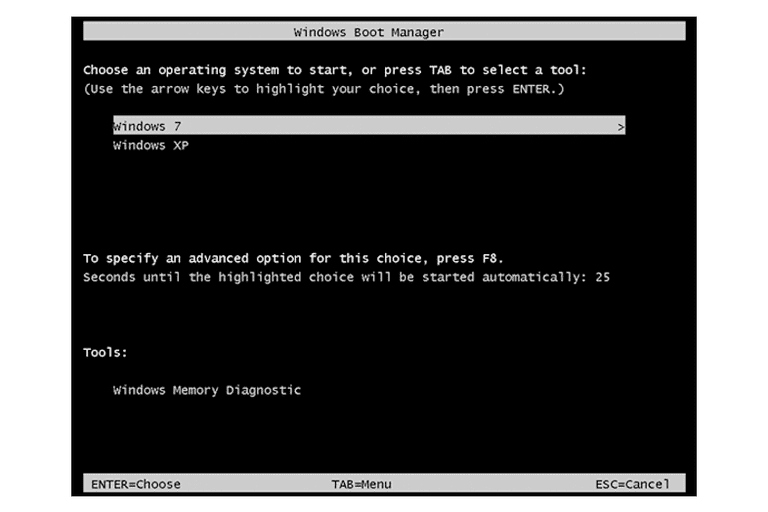 However, the boot options for non-NT versions of Windows cannot be configured through the file, which is why there needs to be an associated file that can be read to understand what to do next - how to boot to the OS. The boot.ini file is naturally protected from modification with the system, hidden, and read-only attributes. The best way to edit the boot.ini file is with the bootcfg command, which not only lets you edit the file but will also re-apply those attributes when finished. You could optionally edit the boot.ini file by viewing hidden system files, so that you can find the INI file, and then toggling the read-only attribute off before editing. If you only have one operating system installed to your computer, you won't see the NTLDR boot menu. The NTLDR boot loader can run from not only a hard drive but also a disc, flash drive, floppy disk, and other portable storage devices. On the system volume, the NTLDR requires both the bootloader itself as well as ntdetect.com, which is used to find basic hardware information in order to boot the system. Like you read above, another file that holds important boot configuration information is boot.ini - NTLDR will choose the \Windows\ folder on the first partition of the first hard drive if boot.ini is missing.